So I was thinking about Micron's name. If you added his dad's name to his, it would be Micron Blaze. Adding my last name would make it Micron Sword. If this makes you wince a little, you probably enjoy healthy and logical thoughts most of the day. If instead you're thinking either of these name combos would make a great name for a rock band or even a comic book superhero, then perhaps you have a creative streak. But if you're actually sounding out the name Micron Blaze Sword and writing it down so you can name your avatar for Diablo III when it comes out in 2010, then I would welcome you to my happy world of Geekville. Just something fun to think about. I'll be going back to my job in finance on Monday to think normal thoughts again. Micron had a wonderful and peaceful Christmas holiday with family and friends.The live tree has survived so far with only one ornament casualty. 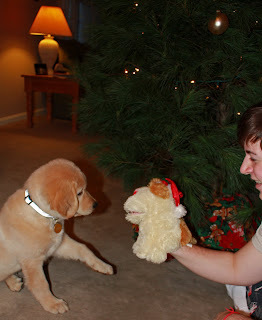 So I will state that it is indeed possible to have a six foot Christmas tree in the same room as a 3 month old puppy. It's helpful to not have any ornaments within easy puppy reach and we did have to be mindful to keep him out of the sap water. After encouraging Micron to understand the difference between inside and outside when it's time to do his business, you gotta wonder what a dog thinks when you bring a tree in the house.To his credit, it didn't occur to him to water the tree for us. That's what the carpet's for. Micron opened a brand new Kong on Christmas morning. The long suffering Jager had asked for the same thing that he wanted last Christmas -- a bowl of water that doesn't have Lab backwash. He got a stuffed frisbee instead. And a couple of tuff tennis balls for the two of them to share. 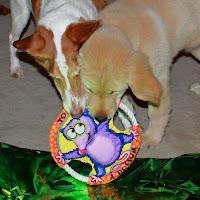 They spent the morning taking the frisbee away from each other and ran manic circles around the Christmas tree while I cringed. We had a vet appointment this week for vaccination boosters. Micron is going to a new veterinary clinic, Brookville Animal Hospital. I've been very pleased with the choice, with both the care and the follow-up calls by the staff. For our friends local to this area, I would have no hesitation in recommending this clinic; it's very clean and the staff is first rate. Dr. Judd gave Micron a good report. I was glad to be able to confirm that he's a healthy pup and his weight is where he should be at 28 lbs. 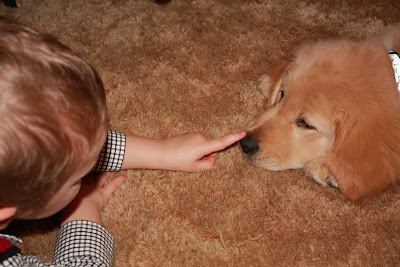 Photos for this post include Micron posing under the sparsely decorated tree (top photo), the two dogs opening Jager's Christmas gift (above left), Derek introducing Micron to the dog hand puppet that barks to the tune of three remarkably annoying Christmas songs (above right), and Micron getting a nose boop from young Beckett, who "doesn't like dogs." (below). Wishing a happy and blessed New Year to all. Have fun, be safe, and make good choices this coming year. It's gonna be a good one.